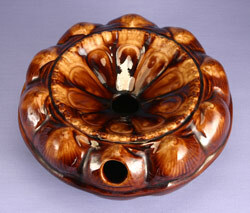 Treacleware is a term mainly used by collectors and dealers when describing brown glazed earthenware. Treacleware is very often referred to as Rockingham ware, which is not wrong but is unsatisfactory for a number of reasons that often lead to confusion. Treacleware is earthenware, it is not stoneware. The glaze used in treacleware varies in composition and colour quite considerably. The common assertion that the brown glaze is basically the result of the addition of manganese oxide (or dioxide) is not entirely true because it fails to appreciate one of the main divisions in the types of treacleware produced. There are two main ways to obtain a brown glaze, you can add manganese dioxide or you can add iron oxide (or both). The manganese dioxide will produce a distinctly purple tinted brown whilst the iron oxide will produce a more neutral brown. In fact it can be seen that the wares produced by the Rockingham factory (the Swinton Works, Yorkshire) and other major potters like Wedgwood, used a largely manganese dioxide based recipe whilst most of the treacleware produced by the smaller factories used a mainly iron oxide based recipe. Over the years it has been fashionable to describe almost every piece of brown glazed earthenware as being produced in one place, initially everything was assumed to have been made by the Rockingham works, then it became fashionable to ascribe everything to Yorkshire in general. Over time, as Scotland discovered more of its potting roots it has now swung over so that almost every treacleware teapot or moneybox etc. is assumed to be Scottish. The simple truth is that treacleware has been made for longer than most people seem to think and was produced by a huge number of potteries throughout Britain (including Scotland, England and Wales). Treacleware - simple iron-oxide brown glaze, usually translucent but may be so dark as to be opaque. Two-Tone Treacleware - as above but with mottled two tone colour. Dipped treacleware - e.g. where only part of pot is dipped in brown glaze. Amber ware - very pale treacle glaze with amber type colour. Bargeware or Measham ware - canal boat ware, treacleware with white sprigs which have also been coloured with on-glaze colouring oxides. Sprigged treacleware - as in bargeware but without the colouring oxides and made widely. Wheel engraved ware - treacleware with wheel engraved designs in surface of glaze. There are other types but that covers most varieties. AP/283 Two-tone treacleware cuspidor or spittoon. With shell decoration around shoulder. This may be Scottish. Late C19th.